My initial inspiration for this design came from looking at photographs of bamboo rafts while searching for destinations to visit in China. 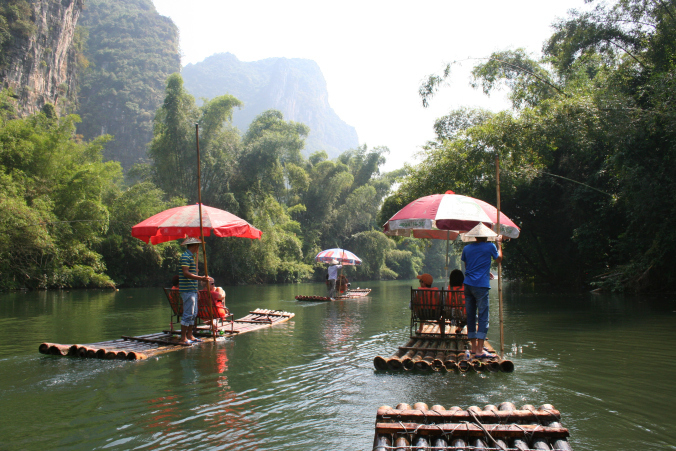 Bamboo rafts are used to take tourists sightseeing on the Yulong River in the Guangxi province, but I imagine that in years gone by the rafts would have had a much more functional use, transporting people and goods from one place to another. The timelessness of these rafts intrigued me, and I was keen to create something with similar functionality, but tailored towards specific activities. My design aim for the Mokolo was to create a boat with super stability. I wanted it to be able to carry a huge load, yet be nimble enough to paddle easily. I wanted it to have minimal draft, so that it could be used in shallow waters that most other craft simply cannot get to. Most of all, I wanted people to be able to do whatever they wished with the boat. Paddle, row, SUP, hook up a little electric motor, stand, sit, sleep, bask in the sun… the list is endless. 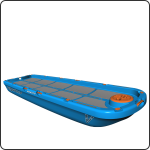 In developing this idea into an actual product, I took further inspiration from a diversity of craft: inflatable rafts, with which I have a lot of experience; bass boats, with their massive stable flat decks; catamarans, which offer maximum stability with minimal draft and drag; SUPs, which are all about standing just above water level; the latest crop of fishing kayaks on the market, which emphasise the importance of customisability; floating jetties, which consist of pontoons connected together; and finally, my own experiences of taking family and friends, children and dogs on the water in various craft. What I ended up with is a design that is unique and extremely versatile. Its simplicity belies the many design permutations that it went through before I settled on the final concept. There is certainly no kayak on the market of the same physical size that can boast the large walkable surface area, or a similar number of rails to which fittings can be attached. The Mokolo can be used in its simplest form as a floating platform that can be paddled from standing or on which to relax with friends, children and dogs. This flat platform can be rigged to the rafters with all sorts of gadgets and loaded with anything from cooler boxes and deck chairs to fishing or hunting gear.